The Waverly is a sleek fiberglass spa that features modern style and contemporary design. This exclusive spa will add a touch of beauty and elegance to your salon and spa. The beautiful Waverly is acetone-resistant and includes a protective gel-coating that guards the spa and sink from rust and corrosion. This stylish pedicure spa features polished chrome hardware, stainless steel shower hose, built-in LED color therapy light, FREE matching pedicure stool. In addition, optional drain pumps are available and can be installed onto your spa. 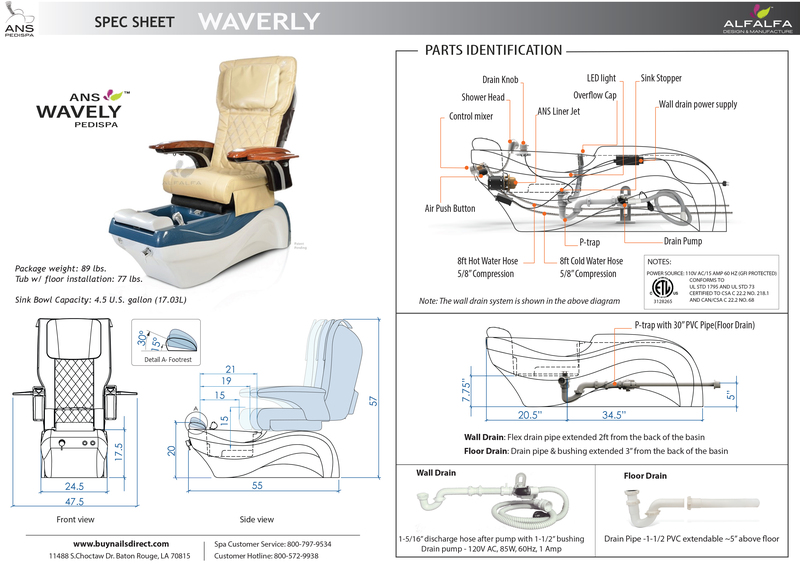 The Waverly also includes a premium massage chair of your choice. Jet. Simply snap apart and soak in sanitizing liquid. No scrubbing or cleaning in hard-to-reach areas.